Presznick shows in her Book 1, plate 10, a drawing of the rosebowl. She describes it as a rose bowl, five inches, and massive. 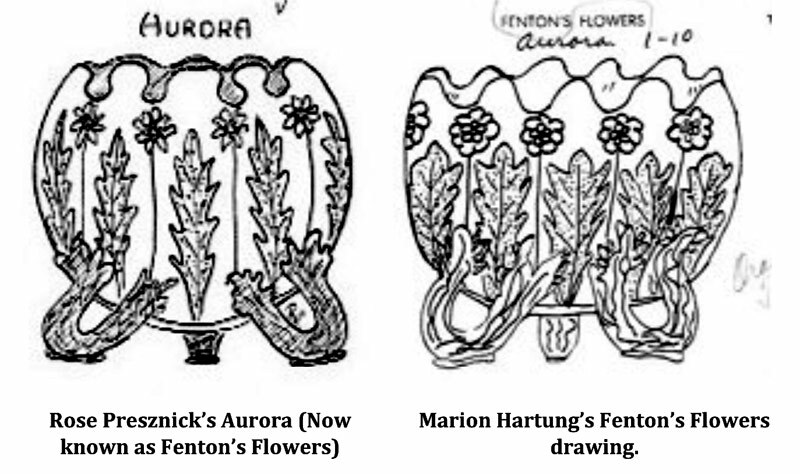 She named it “Aurora (Fenton's Flowers).” She has a drawing in the illustration section of her book. (A scan of this drawing is shown.) There are several additional drawings of the Orange Tree pattern in different shapes and different names in her books. I apologize for any confusion that you have as a result of this article. Just remember, I’m just as confused as you might be. I do believe that “Fenton’s Flowers” is the accepted name for the rosebowl, even though we all know it is part of Fenton’s Orange Tree pattern line. 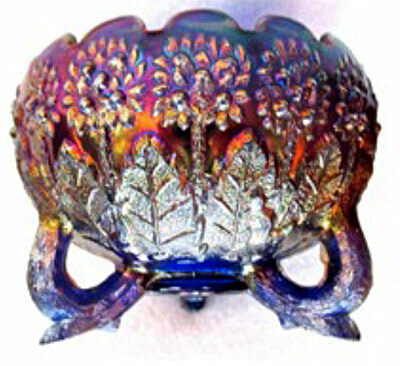 Above is a blue Fenton’s Flowers rosebowl. Photo and drawings courtesy of the Bookers.